When my daughter was born, we placed an advertisement for a nanny in a local newspaper. At 6:30 a.m. on the first day the ad ran, the phone started ringing. It was the first applicant out of hundreds who would call inquiring about the position. What I would have given then for a disposable phone number — something I could turn off once I’d made my hire. Today there are a number of good options for keeping your phone number private. If you’re looking to post your phone number online — for a dating site, if you’re selling something on eBay — you can get a temporary disposable number from Burner (free on iTunes and Google Play). When you first sign up, you get a number for free for the first week. After that, you can pick from a number of inexpensive options. There's the Mini Burner ($1.99 or 3 credits), which lasts for 14 days and is good for 20 minutes of talk or 60 texts, whichever comes first. The Standard Burner ($3.98 or 5 credits) lasts 30 days and includes 150 texts or 50 minutes, whichever comes first. If you want to be able to send photos, you'll need to pay for a Picture Burner package (8 credits or $4.99) for 100 messages (with or without pictures). Credits can be bought in packs of 3 ($1.99), 8 ($4.99), 15 ($7.99) and 25 ($11.99). Google Voice provides a more permanent calling solution. With a Google account, you can get free unlimited calling and texting within the U.S. as well as voicemail, call screening, do not disturb and individual number blocking, among other features. To receive calls and texts, you'll need a smartphone running the Google Voice app (free for iOS and Android) or a computer with internet access. You can take calls with the app or forward them to an existing number. Outbound calls will show your Google Voice number the Google Voice app on your phone or use the Google Voice web app on your computer. 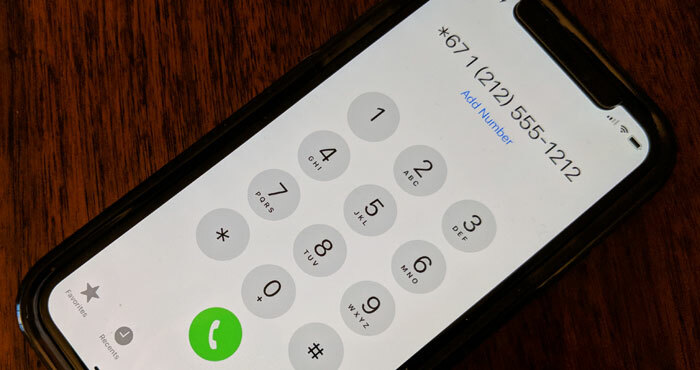 If you don’t want to use your disposable phone number minutes, you can block your outbound Caller ID by turning it off in your phone’s call "settings" on your mobile phone, setting it up in your phone management software if you use a digital phone service or dial *67 before the number on a regular landline phone (for both you'll need to use the country code, so it would look like *6712125551212). Your number will appear as unavailable. For iOS 11, go to Settings > Phone > Show My Caller ID and toggle it off. For most Android phones, go to the Phone app > Settings > Call settings > Additional Settings > Caller ID and select Hide my number. Google Voice is also wonderful for putting a safety layer between callers and your real phone number. And if you install the Google Voice app on your smartphone, you have the option of having the Google Voice number display in caller id instead of your real phone number. Nice job on providing zero free numbers in your misleading article. There is only one “free”, which is babble.ly. All the other ones cost something out of pocket. Just get a pay as you go SIM card for free and use thy number to set up a WhatsApp or telegram signal account. In the UK you can can get free SIM cards from all the major suppliers or even by going into some phone shops and asking for one.